I want to relive my childhood in Susan Miranda’s home where art abounds and at any given time, a big project is unfolding in her living room turned art studio. Susan is an art teacher at a local coop preschool and she creates art in her free time in a variety of mediums. 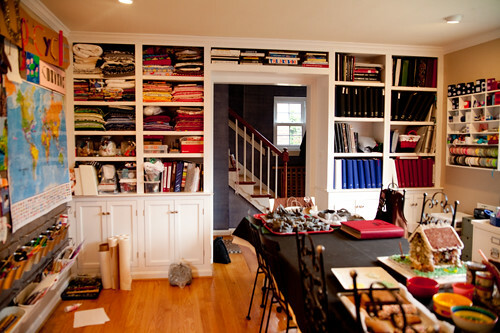 Susan says she “does what she loves,” which means scrapbooking, quilting, painting, quilling, sewing, embroidery, clay sculpting, mosaics, wire sculpting, and “anything else that floats her boat.” Susan took me on a tour of her jaw-dropping studio space, the first thing you see upon entering her home. 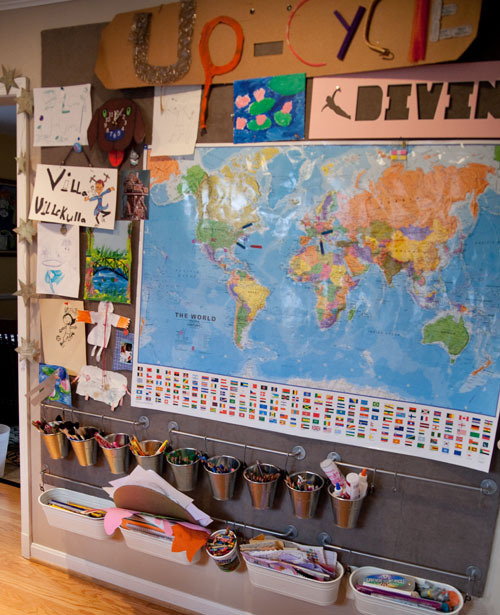 On the wall opposite the windows, Susan made this giant bulletin board. She bought a piece of Homasote type of board cut to size at Home Depot. Homasote is a cellulose-based fibre made from recycled paper that’s sturdy but also soft enough to use with push pins. She covered it with batting and brown fabric that she stapled along the sides. She then added the storage containers from IKEA. The markers incidentally are sorted by color. Children surprisingly tend to comply with the color code. 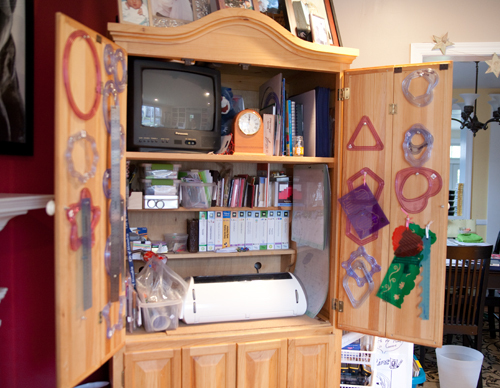 The left-hand built-in bookshelf is stuffed full of quilting fabric pieces and is where Susan keeps her sewing machine and notions. 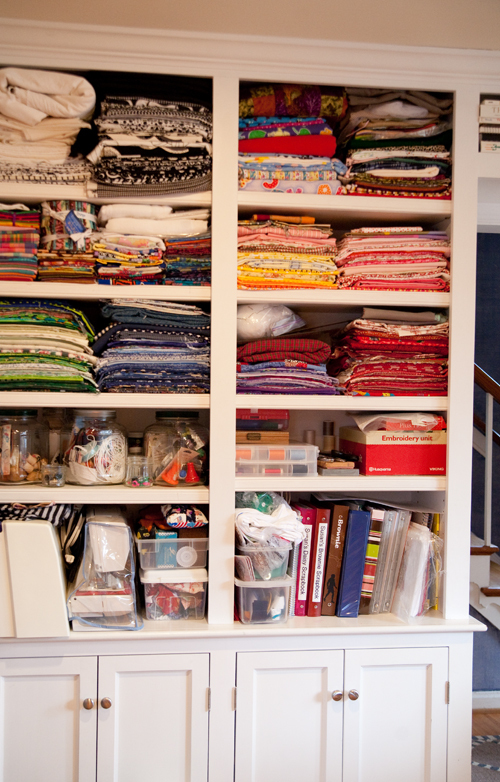 She does a lot of sewing with her daughter, but not as much quilting since having children. 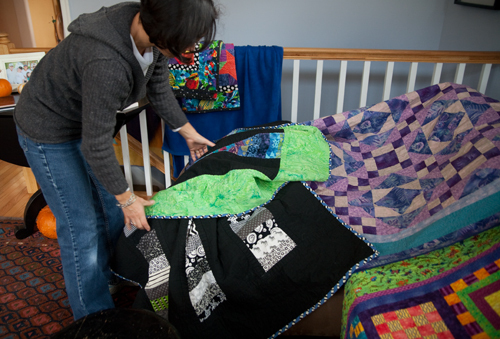 She pulled down some of her favorite quilts to show me the exquisite work she used to do. 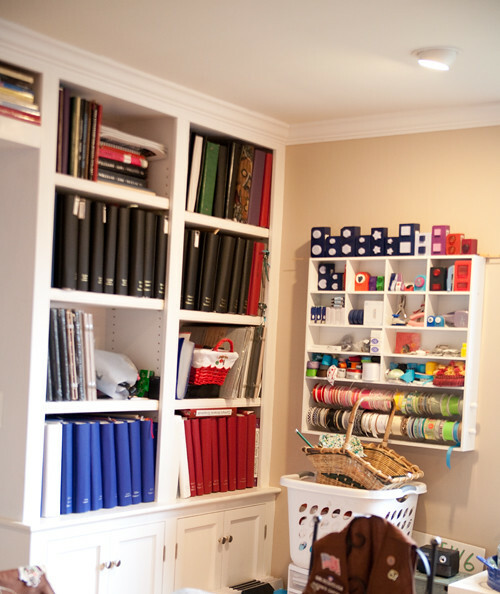 The built-in shelves on the other side of the main doorway is devoted to the voluminous collection of scrapbooks Susan created for her family. She created detailed books for the children up to age 5. 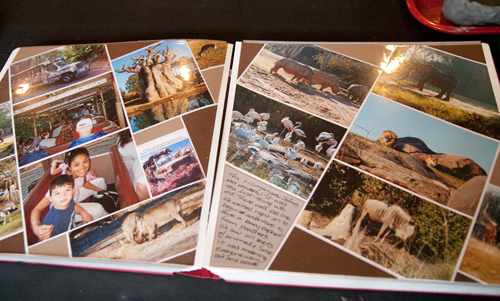 After that, their lives are integrated into the family books. Susan pulled out the book from a trip to Disney World. 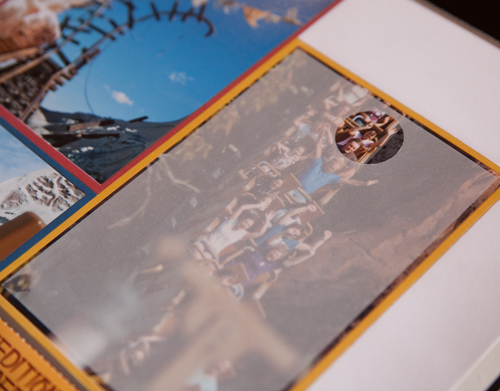 On this page, she used vellum to cover a photo of a roller coaster ride and cut out a small circle to reveal her children on the ride. So clever! Susan is also a rep for Creative Memories and does scrapbooking events and hosts a once-a-week scrapbooking night with friends. Her scrapbooking supplies extend along the front wall with this hanging storage shelf that has stamps, ribbon, hole punches, and the like. 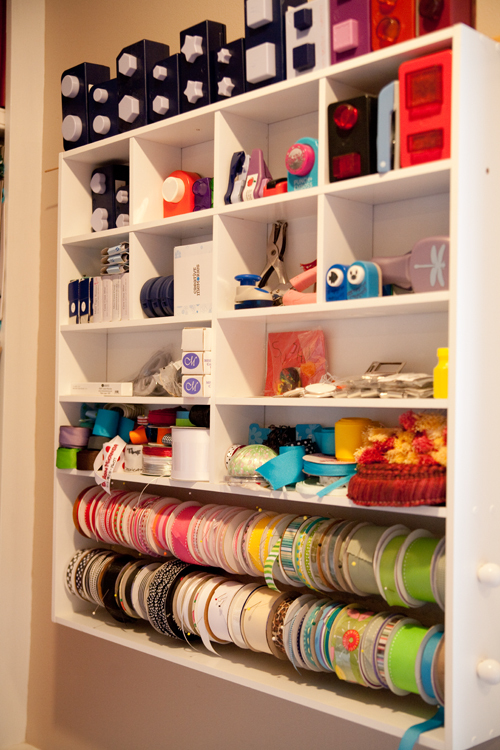 There’s no lack of paper and various types of cutting mats, knives, and scissors either. A long work table extends the length of the room and is taken up with projects in various states of completion. 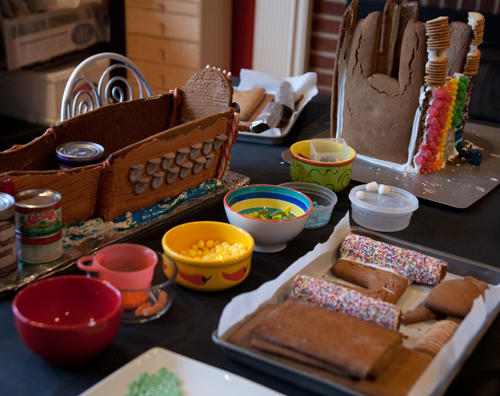 On the far end are the ginger bread houses in the works. Every Fall, the Mirandas host a neighborhood ginger bread decorating party. The event has grown from 12 families to more than 100 participants and they set up a tent in the front yard to accommodate everyone. Meanwhile, Susan’s children work on their own houses. Her son Dillon is making a ship based on the Vasa, the famous Swedish warship they saw on their summer trip to Sweden. Corrine is making a castle. Every year, one house is raffled off. 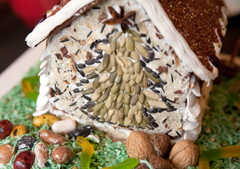 This year’s design is a bird house. 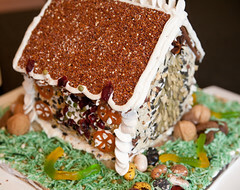 And when the recipients are done using it as a center piece, they can place it outside to be eaten by the birds. 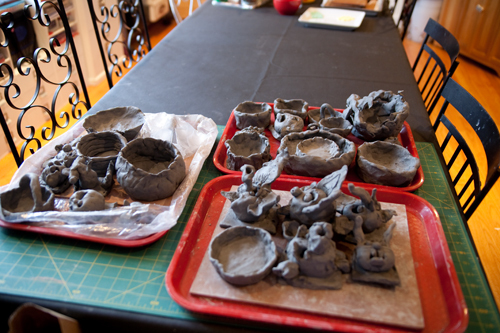 On the other end of the table, Susan is drying the wonderful clay creatures that the Brownie troop she leads made. In the dining room, Susan has a kiln, believe it or not, that she found on Freecycle. It’s not working yet, but you can bet she’ll be firing clay creations soon enough. I first heard of Susan when she and her business partner set up a booth on a Del Ray First Thursday with demonstrations for children (and adults alike) to announce their nonprofit, Up-cycle Creative Reuse Center. 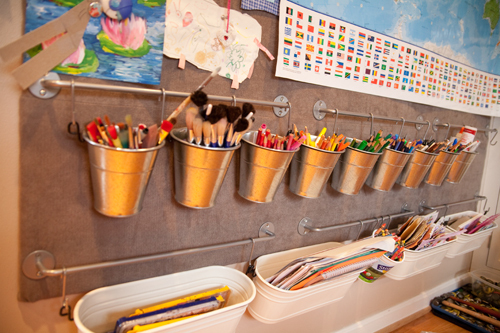 They collect and redistribute materials to support artistic expression and experiential learning. Much of the supplies are housed in Susan’s basement currently. 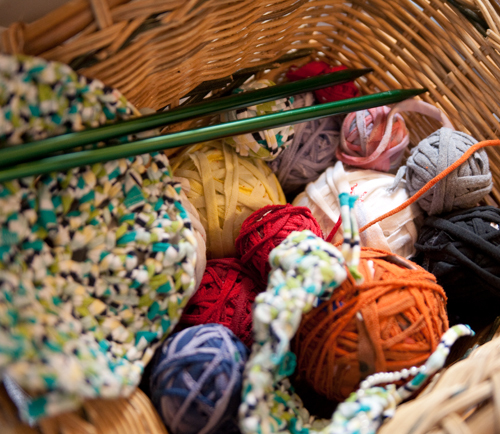 This project is an effort to reweave old tshirts to knit or crochet into upcycled creations. DIY Del Ray looks forward to seeing their future retail space and finding fun ways to partner with them. What an incredible studio! Thanks for sharing! 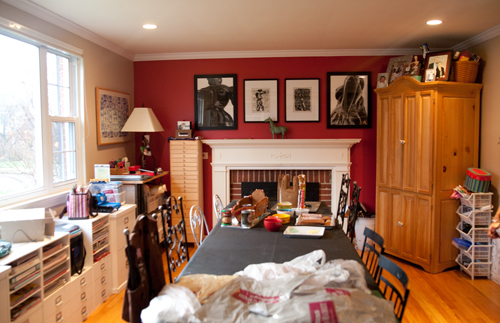 I was looking for inspirational ideas on how to use my living room/dining room as an art studio. This really helped. Thanks. It looks great, alive, colourful and fun. Cheers!